Cars that automatically slam on the brakes to avoid a crash are now cheaper to insure. Technology which slams on the brakes in slow-moving traffic if the driver isn’t paying attention -- and miss a fender bender by mere centimetres -- is now so reliable one of the country’s biggest insurers will offer a discount of between 10 and 15 per cent on their policies. NRMA Insurance says the savings in annual premiums range from about $50 on a $13,990 Volkswagen Up hatchback, $120 on a $50,000 Subaru Forester SUV to $450 on a $200,000 Mercedes-Benz S-Class limousine, depending on individual circumstances. “We believe automatic emergency braking (AEB) is a solid advance in driver safety given that it helps prevent collisions and minimises the risk of injury to drivers,” said NRMA Insurance head of research Robert McDonald. The insurer says “about 80 per cent” of crashes happen at slow speeds in stop-start traffic. Most of the systems can bring a car to a complete stop -- without crashing into the car in front -- from between 30km/h and 50km/h. Only cars with automatic emergency braking (AEB) fitted as standard equipment -- and tested by NRMA Insurance -- will initially be eligible for the discount. At least 14 cars from six manufacturers have AEB as standard on selected models (see below). Even though the technology is available as an option on at least nine other cars -- including the Ford Focus, Ford Kuga, Volkswagen Golf and Volkswagen Passat -- the insurer says it will be too hard to determine which vehicles have been fitted with the system given most policies are arranged over the phone or online. The most expensive versions of the Mazda3 small car, Mazda CX-5 SUV and Mazda6 mid-size car will not be eligible for the discount -- even though they have automatic emergency braking as standard -- because early examples did not pass a test by NRMA Insurance. Volvo was the first manufacturer to introduce automatic emergency braking, launching it in 2009 on its XC60 family SUV. The technology initially worked at up to 30km/h but has since been upgraded to work effectively at up to 50km/h, and is now standard equipment on at least three Volvo models priced from $37,000 to $70,000. The cheapest car on sale in Australia with the technology is the Volkswagen Up, which costs $13,990 drive-away, but this model is about to be withdrawn from showrooms due to slow sales. The most expensive versions of the Subaru Forester, Outback and Liberty (priced between $44,000 and $58,000) use a camera system mounted behind the windscreen, as opposed to other companies which use radar and laser sensors. The new Mercedes-Benz C Class released next month will have AEB standard on all models, starting from $60,900, joining three other cars in its range. Other “forward warning” systems can slow a car from between 15km/h and 100km/h, but they still make an impact with the car ahead; the technology is only good enough at this stage to reduce the severity of the crash. For now, NRMA Insurance is focused only on the systems that work at slow speeds and can bring the car to a complete stop. 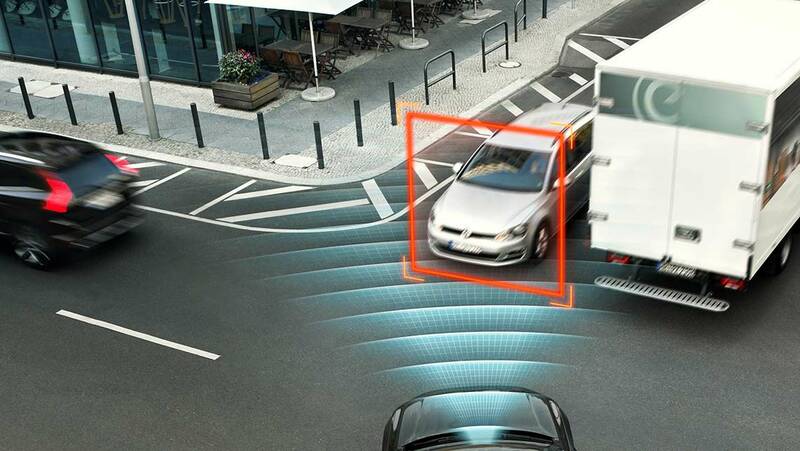 “As technology develops, there is the potential to provide more significant safety benefits to customers travelling at higher speeds and even while reversing,” said Mr McDonald. Note: AEB is available as an option on some models not listed here.